I always like to promote my local tools store's tools sales, and this time it is all about Bosch. 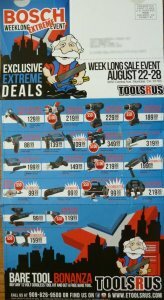 Tools R Us is offering huge sale prices on most of Bosch's popular tools, and even some of the newest Bosch tools. Check out the images below to see what is being offered. If you are in the area of Montclair California any time this week and you like tools, you probably want to check it out.